If the character is dark coniferous taiga evergreen spruce, is a symbol of warm, sunny tropical - coconut palm. If we look at a classic tropical landscape, we see white sand coral atolls, blue sky, hot sun, turquoise, clear water. And be sure to attend this landscape will be a coconut palm. 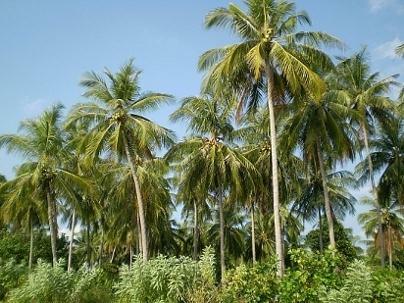 Birthplace of the coconut palm is expected to Malaysian Archipelago. Coconut tree the most desirable and sought-after tree in the tropics. His out there called the "tree of life" and it's not just words. People in the tropics are used almost all parts of the tree. Leaves and wood used for construction, fruits for food. But for many people is a coconut tree as the tree of life and death. 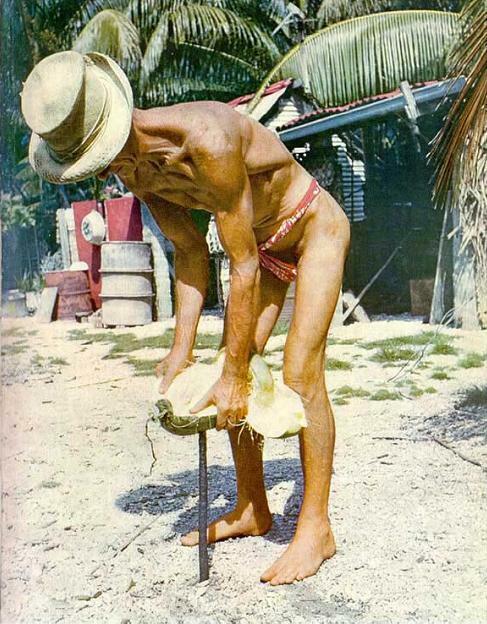 as a fallen coconut at the man's head can be fatal. Each year, the fall of nuts killed about 150 people! Just drop it on the car for example - can also be enjoyable because of the dents. 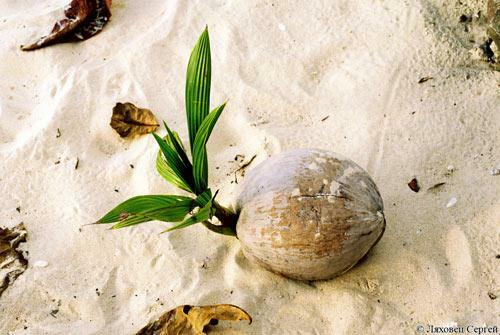 The average coconut, weighing about 1 kg of beating the ground with a ton of force. Let us consider more closely part of the coconut palm. What we see in supermarkets - it is peeled nuts (actually a drupe or stone edible, the fruit inside the fruit), but in the whole form of the nut is much larger. The outer shell nuts (ekzokarp) fibers is penetrated, it protects the integrity of a nut when it is falling. Then comes the inner shell (endocarp) - this is a coconut shell with 3-cell, reminiscent of the eye. It is the pores, leading to three ovules, one of which later develops into a seed. 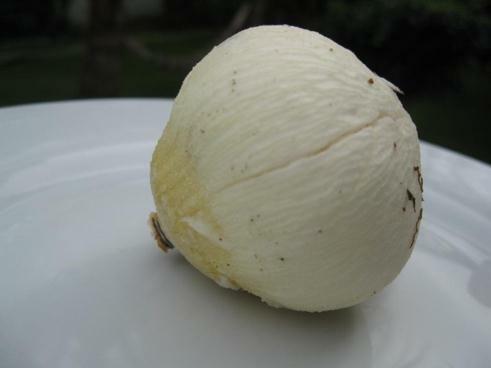 The seed has a fleshy white surface layer thickness of about 12 mm (flesh or copra) and the endosperm. 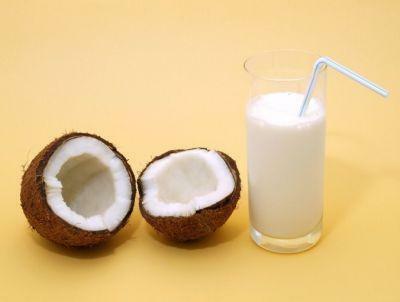 Endosperm, at first thin and transparent (coconut water), with the advent of drops of oil in it allocated copra, gradually turns into a milky emulsion (coconut milk), and then thickens and hardens. The fruits of the coconut palm trees grow in groups of 15 - 20 pieces, all maturing within 8 - 10 months. In cultivated as a tree begins to bear fruit with 7 - 9 years and continues for about 50 years. One tree yields from 60 to 120 fruits per year. 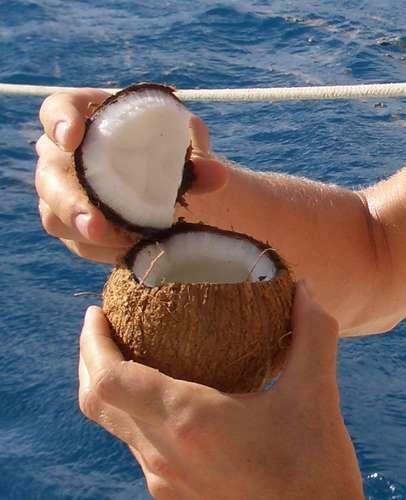 How to open a coconut? In the immature nut, with a green cover, the very much a water and least of all the white pulp. It is easy to cut, in place fastening nut with wood, and can a severe blow split at a stone, but it can shed a pleasant liquid. In a mature nuts most sweet liquid. The outer layer, together with the fibrous layer is cleaned by means of thrust in the ground stake, as well as can be cleaned with a knife, this is a laborious process. Mature fruits have a dark outer shell and brown inner shell, which we are accustomed to seeing in supermarkets. The form is a nut sometimes like ball out of college football. Here we see these same three pore-like eyes. To reach the cherished those liquid, need pierce a sharp object that eye. It is recommended to pierce two eye that flowed from one fluid to another and dropped the air. The same principle is recommended that you open a box of juice, making a hole next to the main. Once all the liquid was poured their nuts - it must be open to get to the copra. To do this he needed to tap some of the circle object, such as a machete or even a hammer. We got to the copra, cut off it and eat, or for any other purpose. Bon Appetit! Since the Polynesians of the Cook Islands called sprouted coconuts. 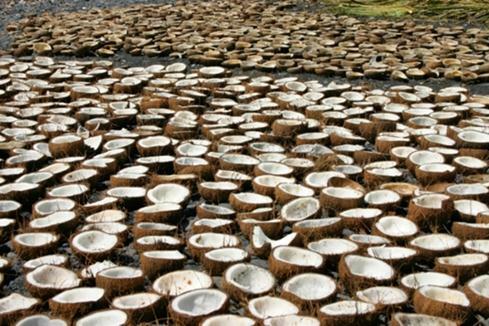 The interior of the sprouted coconut, the flesh is more tender and cooked on the coals, like the taste of the pudding. After preparation Uto on the coals, chop nuts easily, and is produced in the same manner as applied to a mature coconut, without piercing "eyes." 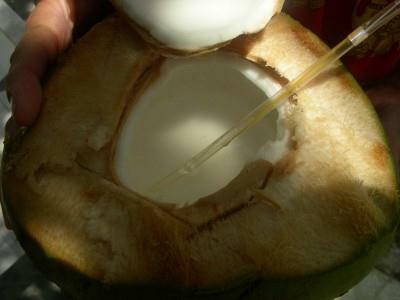 The coconut water - it is an internal part of the endosperm, a copra - this is an external part of it. Copra is the source of coconut oil, which is a valuable product because of the content of various fatty acids. It is used in cosmetic and health purposes. Billet of copra was at one time almost the main occupation of the inhabitants of tropical islands. Tropical atolls specially planted with coconut palms for harvesting a copra. It was a valuable commercial product traders of the South Seas and South Asia. Harvesting copra do to this day. 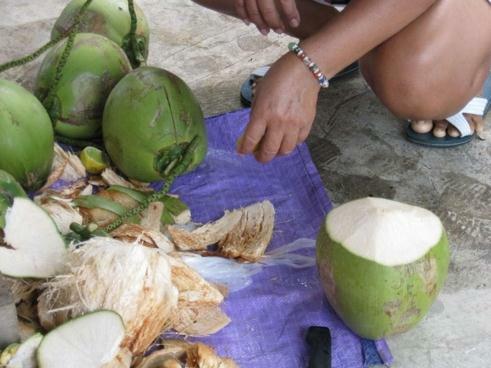 Copra crumbles and then boiled in water to produce coconut oil. Copra contains 70% coconut oil. Side product contains 18 - 25% protein and is used as animal feed. Coconut trees are planted at a range of 9 m from each other, giving a density of 100-160 trees per hectare. The average wage in Vanuatu is 0.20 U.S. dollars per kilogram of nuts, which is about eight fetuses. Total $ 320 a year per hectare. The most big earner copra are the Philippines. The annual production volume exceeding $ 80 million. Copra harvest as well as large companies, and private farmers. If not properly drying copra may appear Aspergillus, that produce the deadly poison - Aflatoxin. According to some reports, he is considered the most potent carcinogenic and causes liver disease. Aflatoxin can be transmitted to humans through milk and meat animals who have eaten this copra. 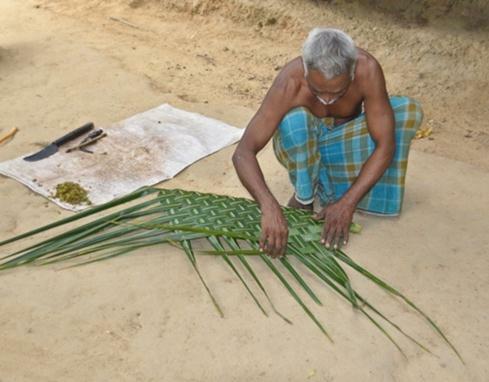 Coconut leaves, as well as coconut wood used for construction. From the leaves do the weave, and then constructing tropical hut. From the leaves weave baskets and all sorts of things. 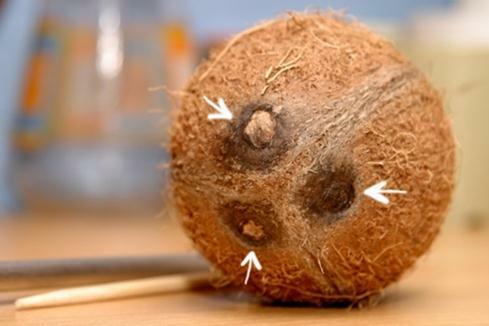 From the coconut shell can be made simple plants for a food. During the Pacific War of 1941-45, both sides in the conflict regularly used coconut water - as an "alternative" plasma of blood for the wounded. 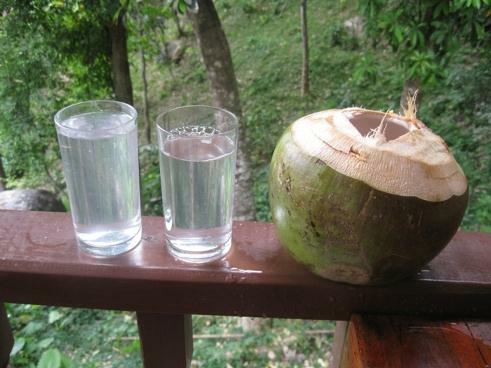 Coconut water is the universal donor, it is identical to human blood plasma. Coconut water is a natural isotonic beverage with the same level of electrolytic balance as we have in the blood. 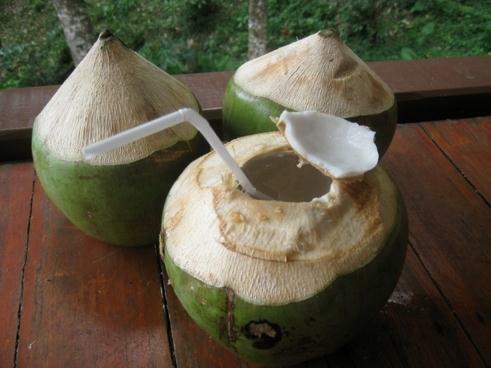 Coconut water is more nutritious than whole milk - less fat and no cholesterol! In Coconut water's unique content of chloride compounds (118 mg) as compared to sports drinks around (39 mg). Coconut water contains about 294 mg of potassium, more than almost all sports drinks (117 mg), and energy. At the same time there is less sodium (25 mg) than in sports (41 mg) and energy (200 mg) drinks. Natural sugars in coconut water - 5 mg, sports and energy drinks - from 10-25 mg of modified sugars. Chloride - 118 mg versus 39 mg of chloride in sports drinks. Contains: saturated fat, dietary fiber, sugars, protein, vitamin C, riboflavin, thiamine, viatsin, vitamin B12, vitamin B6, folate, pantothenic acid, choline, calcium, magnesium, phosphorus, iron, potassium, zinc, sodium, selenium, copper, manganese. Coconut oil 1.0 - 3.0% stearic, 7.5 - 10.5% palmitic, 13 - 19% myristic, 44 - 52% lauric, 0.2 - 2.0% nylon, 6.0 - 9.7% caprylic, 4.5 - 10% capric, 5 - 8% oleic, 1.5 - 2.8% linoleic, and 1.3% geksadetsenic acids.